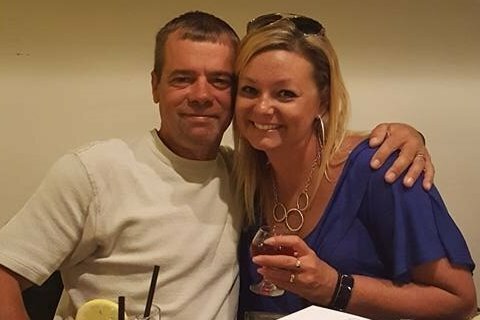 Photo of Matt Howe from the GoFundMe Page to benefit his family, located at https://www.gofundme.com/f/please-show-your-support-for-a-nysdot-worker. In honor of DOT maintenance worker Dennis “Matt” Howe, age 45 of Owego, Governor Andrew M. Cuomo today directed flags to half-staff on all State government buildings. Howe died from injuries sustained last Wednesday when a tractor-trailer collided with a DOT truck in the work zone on March 13 in Nichols, N.Y. According to the original Sheriff’s report, the crash happened between Exit 63 to Lounsberry and Exit 62 to Nichols. According to deputies, the tractor-trailer struck a DOT vehicle while passing by the work zone. Flags will be flown at half-staff beginning today, March 19, until interment. In honor of Matt Howe and his service to the people of New York, Governor Coumo directed that flags be flown at half-staff across New York State. A GoFundMe account was set-up to offset medical expenses for his family. In an update on the page, with funds now benefiting the family, donations can also be sent to the local VFW Post 1371, 207 Main St., Owego, N.Y. 13827. You can find the link here: https://www.gofundme.com/f/please-show-your-support-for-a-nysdot-worker. Be the first to comment on "DOT worker dies after crash on Route 17; Governor Cuomo directs flags to half-staff"